I don’t know about you guys, but I’m a self-proclaimed pasta addict. There’s just something about all the culinary possibilities! I love experimenting with favors and ingredients to create inspiring dishes and I rarely make the same dish twice. But, with all the interesting combinations I can come up with, this recipe is one of my go-to pasta dishes. Plus, it’s quick and easy thanks to our Torino Tomato sauce. 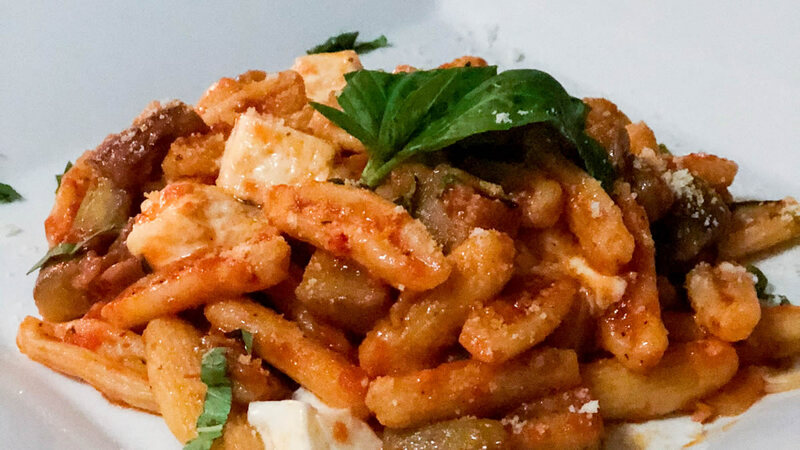 Named after Vincenzo Bellini’s opera Norma, pasta alla Norma is a signature Sicilian dish made up of sautéed eggplant tossed with tomato sauce and cheese. Traditionally it is topped with grated ricotta salata, a hard, salty cheese. But, depending on where you look, you’ll find many different versions of this recipe. I’ve tried a few options and found that my cheese of choice is fresh mozzarella. It has a less salty flavor than the ricotta salata but adds a great textural element due to its ability to melt. 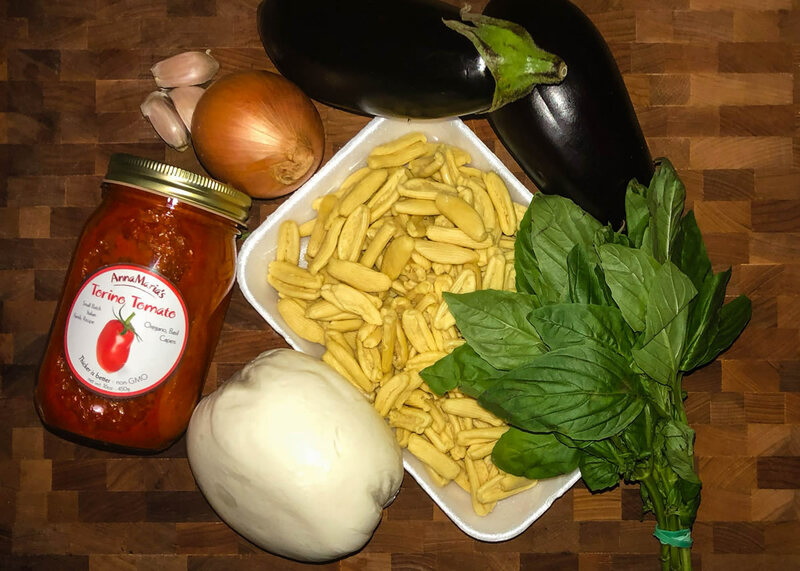 You can also try this recipe with regular ricotta cheese, but I find it tends to mix a bit to well with the sauce, dulling down the flavor. Regardless of your cheese choice, this recipe is sure to be a winner, and it can be thrown together in under an hour! 1 lb. fresh cavatelli pasta. Frozen cavatelli also works well. 1 jar AnnaMaria’s Torino Tomato. First, put on a pot of salted water to boil. Then prep your ingredients. Chop the basil and cut your fresh mozzarella into ½ cubes. Dice the garlic. Chop the onions and peel your eggplant. Once the eggplant is peeled, slice them lengthwise and remove the seedy flesh at the center. Then cut them into strips and chop into about ¾ inch cubes. Get a large nonstick pan nice and hot. 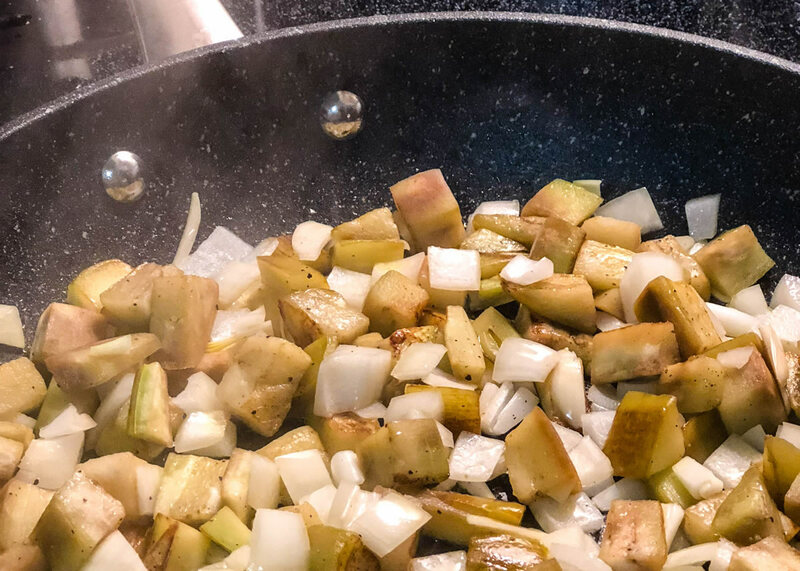 Heat up your olive oil, then toss in the onions, garlic, and eggplant. Season with salt and pepper. Mix everything together thoroughly to make sure the oil evenly coats your veggies. As the flesh of an eggplant is like a sponge, you may need to add a bit more oil. The goal here is to get some color on your eggplant, so don’t over stir. Let everything sit for a few minutes until the eggplant has a nice golden color on one side. Give it a stir and allow it to brown evenly. By this point your water should be boiled and ready for your pasta! If you’re using fresh cavatelli, keep a close eye on it as fresh pasta always cooks in a portion of the time frozen or dry pasta does. For al dente, cook for about 4-5 minutes. 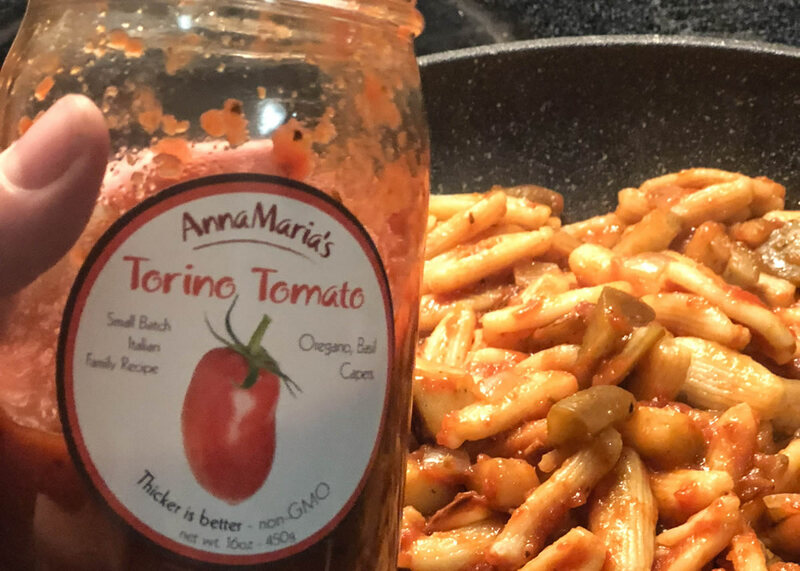 As the cavatelli is cooking, lower the heat on your sauté pan and add 1 jar of AnnaMaria’s Torino Tomato Sauce. Mix thoroughly and cook until heated. Drain your pasta and mix it together with your sauce. Once incorporated, gently fold in the mozzarella and half the basil. Top with grated cheese and the remaining basil as a garnish.